When teaching bills to my students, I first give them all a bill to look at. We discuss sections of the bill as a class so that each student is familiar with what they are looking for (date due, amount due, account number, etc). 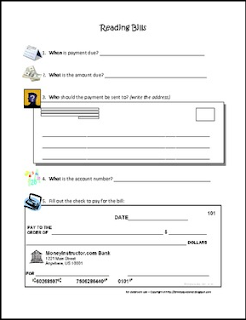 Students then fill out this worksheet including real life applications, such as an envelope to write out the address and a check to fill out the amount. ***Looking for more special education math products? Check out these Dollar Over and Change Back leveled worksheets that will generate new numbers every time the worksheets are opened! 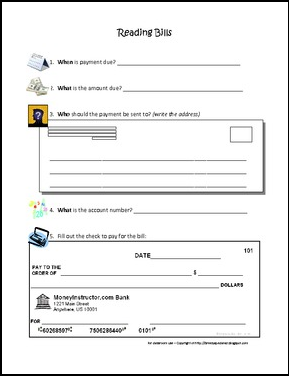 Or you might be interested in this product to help teach student how to Tip at Restaurants! Learning Goal: Students will gain a broader knowledge on the items that people are billed for each month. Students will recognize key words/numbers in a bill or statement. Students will continue to gain knowledge on the value of money. CC.2.MD.7 Work with time and money. Identify date due, amount due, account number, company, and address. Legibly write out the company’s name on the first line. Legibly write out the PO Box number on the second line. Legibly write out the city, state, and zip code on the final line. Legibly write the date in numbers. Legibly write the company’s name on the pay to: line. Legibly write the amount due in numbers after the $ sign. Legibly write the amount due in words on the next line. Legibly write the account number on the memo line. Sign their name on the signature line, in cursive if the student has the ability to do so.